14.3.1 Apply various dietary guidelines in planning to meet nutrition and wellness needs. 14.3.2 Design strategies that meet the health and nutrition requirements of individuals and families with special needs. 14.3.3 Demonstrate ability to select, store, prepare and serve nutritious and aesthetically pleasing foods. 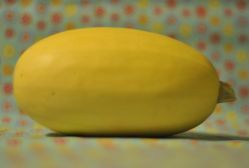 Show students an actual spaghetti squash and ask them what if they know what it is? Ask how many have ever grown, prepared or eaten one? Discuss that MyPlate and the dietary guidelines encourages us to eat our veggies and this one may surprise you. Why? Swaportunity: a great pasta replacement or substitute! Versatile Cooking Options: bake it, broil it, microwave it or stir-fry it. Servability: great as a side dish, main dish or even as a dessert. Preheat oven to 375 degrees and cut spaghetti squash in half and scoop out the seeds. Lay cut side down in baking pan and with a fork prick several holes in outer shell of squash. Bake for 45-60 minutes. Or cook whole in the microwave like the YouTube clip demonstrated if short on time. Once squash is cooked, use a fork to gently scrape out spaghetti strands and then place strands back into shells. Prepare sauce by melting butter in saucepan over medium low heat. Once hot, saute garlic for a minute or two. Whisk in flour and stir for approximately one minute. Once hot, add cream cheese and stir till smooth. Remove from heat and add parmesan cheese and salt and pepper. Pour sauce over spaghetti squash halves and coat as much as possible. Garnish with more parmesan cheese and parsley and broil to melt. Serve hot.